1. What is a variation under AS 4000? 2. When can a variation be directed? The superintendent can only direct a variation under AS 4000 before the ‘date of practical completion’. The contractor is not bound to comply with a direction to perform a variation after the date of practical completion. Clause 36.1 also states that a variation must be ‘of a character and extent contemplated by, and capable of being carried out under, the provisions of the Contract’. The general idea is that the superintendent cannot direct the contractor to perform a variation if it involves work that is entirely different to the type or extent of the work the contractor was originally engaged to perform, or if it is otherwise unable to be carried out under the provisions of the contract. 3. How does the variation process start under AS 4000? The contractor must not carry out a variation unless it has received a written direction in writing. Relevantly, AS 4000 contemplates two types of direction. The first is a direction of a proposed variation (under clause 36.2). This is not a direction to execute a variation. Rather, it is (in effect) merely a request for an estimate in relation to a potential variation that may or may not be directed after receiving an estimate from the contractor. This is an optional step, as shown in the flowchart above. The second is a direction to perform a variation (clause 36.1). The superintendent is able to give this type of direction regardless of whether it has first given notice of a proposed variation. 4. How do you respond to a notice of a proposed variation? If you receive a written notice of a proposed variation from the superintendent, clause 36.2 requires you to provide a response ‘as soon as practicable’ after receiving it. 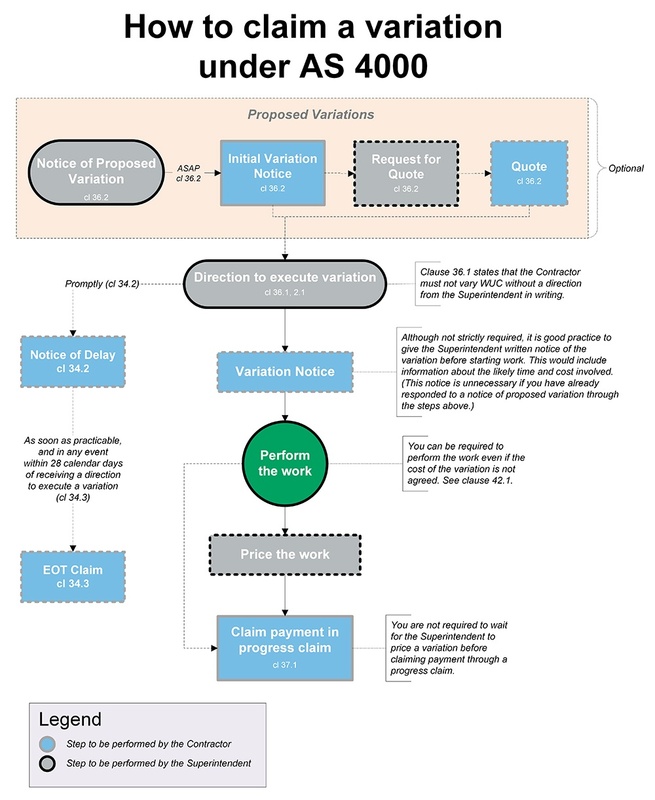 This is shown as the ‘Initial Variation Notice’ in the flowchart above. Your response should identify whether the variation can be effected. If it cannot be effected, you are not required to proceed with it. the cost of carrying out the variation, including all time-related costs. Keep in mind that this initial response is simply intended to be an ‘estimate’. Detailed calculations or supporting information is not required. If, after receiving your estimate, the superintendent requires more information, it can direct you to provide a detailed quotation supported by measurements or other evidence of cost. The last paragraph of clause 36.2 expressly entitles you to claim your costs of preparing an estimate or a detailed quotation for a proposed variation. If you wish to claim those costs, we suggest you include a statement to this effect in your response, identifying the amount you intend to claim and how the amount has been calculated. 5. Does a direction to execute a variation need to be in writing? Yes. A direction to execute a variation should always be in writing. This is because, pursuant to clause 36.1, if you vary the work without a written direction, you will be in breach of the contract. Also note that, pursuant to clause 20, if the superintendent gives you an oral direction, you are entitled to request that it confirm the direction in writing. Provided you make such a request, you are not bound to comply with the direction until that written confirmation has been received. 6. What if the superintendent directs you to proceed without requesting a price? 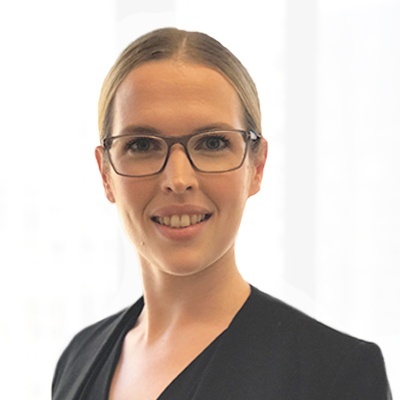 Because the superintendent is not bound to issue a notice of a proposed variation before directing you to carry out a variation, it is theoretically possible that you could be required to carry out a variation without you having first given any indication as to the likely time or cost consequences. As a matter of practice, we would suggest that you avoid this situation wherever possible. either invites the superintendent to confirm the direction before proceeding, or states your intention to carry out the work unless the superintendent directs you to the contrary. The purpose of this notice is to eliminate the possibility of the principal complaining, after the works have been performed, that it would not have ordered the variation had it known of the additional time and/or cost involved. 7. What should you have before starting work? a notice in writing from you explaining the consequences of the variation. Note that the price of the variation does not have to be agreed before you start work. The superintendent can require you to perform the variation and price the variation after the event. Also note that, pursuant to clause 42.1, you are bound to continue performing your obligations under the contract notwithstanding the existence of a dispute. This would mean that you could be required to perform a variation even if there is a dispute about price. 8. How do you deal with delay? Clause 34.2 of AS 4000 requires you to submit a notice of delay promptly after becoming aware of anything that may probably cause a delay to the work under contract. you should consider giving a notice of delay if the direction will result in a delay. If you require an extension of time for a variation, you must claim an extension of time within 28 calendar days of becoming aware of the cause of the delay (clause 34.3). If a variation causes a delay, you will be entitled to claim delay costs (either as a compensable cause or as part of the variation). More information on how to give notices and make claims in relation to delays can be found here. 9. When can you claim payment for a variation? In most cases, you will be entitled to claim payment for a variation through your regular progress claims. This applies regardless of whether the variation has been approved, and irrespective of whether the variation has been completed. The security of payment legislation entitles you to claim payment for work performed. In most cases, this will include variations. Note that there can be exceptions, such as in Victoria (as we explain here). If you disagree with the superintendent’s treatment of your claim, the security of payment legislation may provide an interim remedy. In any event, clause 42 of AS 4000 prescribes a method for resolving disputes. You can download a print-friendly PDF version of the variation flowchart above by clicking here. Want to know more about AS 4000? Our AS 4000 Contract User Guide is available here.